This week’s “how to” article highlights the “Assessment results over time report,” one of the Questionmark Analytics reports now available in Questionmark OnDemand . 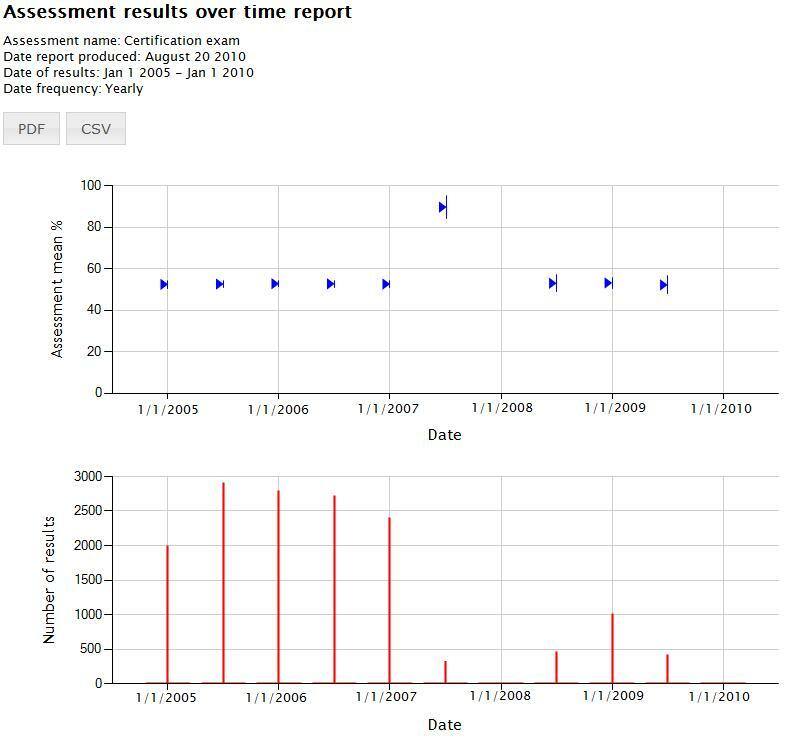 Who should use it: Assessment, learning and education professionals can use this report to view and filter assessment results over time, making it easy for them to flag abnormal patterns that may indicate a statistically significant difference between the means. How it looks: This report offers a lot of information graphically and compactly, making it easy to interpret vast amounts of information quickly. It is broken down into two components (graphs). 1. A graph displaying average assessment scores achieved by participants over a period of time. The blue triangles represent the means for the assessment results. The vertical lines next to the triangles denote confidence intervals: long bars indicate the data is varied and short bars indicate high confidence in the mean value. It’s easy to see in the first graph that the results of tests administered just before September 6, 2010, differ dramatically from the other results during this period! 2. A graph displaying the number of results from the same time period. This volume information can help plan administration sessions and load. A PDF and an analysis-friendly CSV can also be generated.